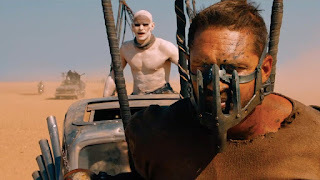 A franchise reboot roaring down the desert wastelands a full 36 years after the original, Mad Max: Fury Road sticks close to the series ethos while introducing a new heroine and delivering the wildest possible ride. In a future devastated by war, Max (Tom Hardy) is captured by the War Boys and held as a prisoner and a "blood bag" at the Citadel, ruled by the demoniacal Immortan Joe (Hugh Keays-Byrne). Joe and his sons control the masses by limiting their access to fresh water, and controlling the import of fuel from nearby Gas Town. Furiosa (Charlize Theron) is the designated driver of the armored war rig dispatched to bring in the latest shipment of gas. On this trip she has an agenda of her own, leading her small convoy off course and into the desert. Furiosa has freed Joe's five slave wives, stashed them in the war rig, and plans to take them to a "Green Place" that she remembers from her childhood. 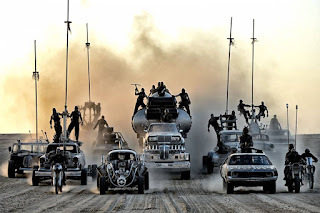 Her attempted escape sparks a chase by Joe's army of men and vehicles, including the dedicated young War Boy Nux (Nicholas Hoult), tied to his blood bag Max. Joe wants his wives back, Nux is intent on dying in the service of Joe, Max just wants to live through the ordeal, and Furiosa is seeking redemption by freeing the women she had previously helped to subjugate. 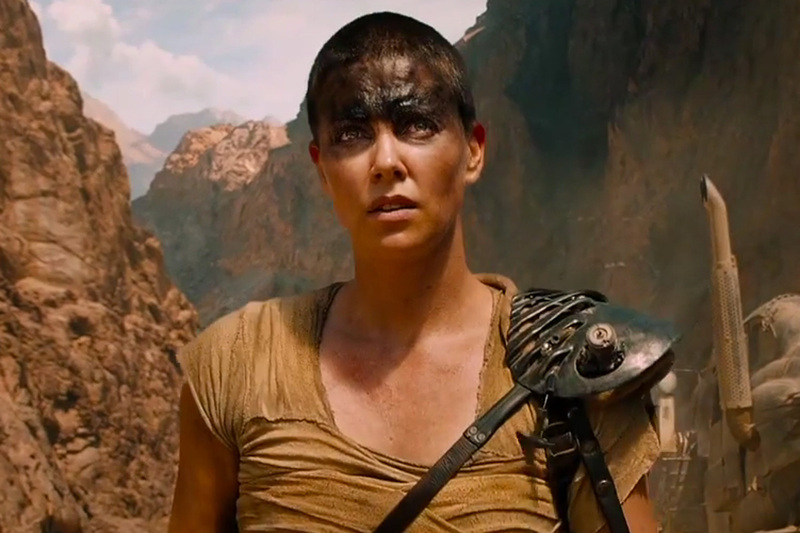 Max and Furiosa eventually join forces to face the dangers of sand storms, marauders and an unforgiving desert in a chase through desolate terrain. Directed, co-produced and co-written by original series creator George Miller, Mad Max: Fury Road is two hours of roaring engines, imaginative machinery, post-apocalyptic maniacs, high speed carnage, ridiculous outfits, unbelievable but real stunts, and outrageous destruction. And it's all delivered with loving beauty, a symphony of annihilation where every note contributes to the artistic devastation. Once the chase begins early in the movie, there is barely any respite. The pauses between grand motorized confrontations are brief, and are mainly there to allow John Seale's cinematography and the Junkie XL music to bring to life the next astonishing tableau in a destroyed world. The seemingly barren desert is filled the expected sand dunes and mammoth sandstorms, but also surprises ranging from elegant rock formations to hostile swamps. These serve up a variety of scenic obstacle courses to mix-up the succession of skirmishes between Joe's army and Furiosa's small group of escapees. Most of the stunts are real, Miller only rarely resorting to CGI, and the madness of the physical execution is evident on the screen. Miller also makes sure to drop in a not insubstantial amount of mean humour amidst all the violence, with the chain connecting Max and Nux used a great prop to complicate the early battle skirmishes. Within Immortan Joe's army vehicles, a tireless heavy metal guitarist and a troop of drummers provide an insanely funny soundtrack of death. In the few context-setting scenes and even fewer lines of dialogue, the premise is sketched in with sufficient details to bring the story to life. The Citadel is an old fashioned dictatorship with an unhinged ruler who wields control by manipulating natural resources, while lining up his sons as his successors. Immortan Joe has a harem and slaves at his disposal, and is worshipped as a deity. His pale faced War Boys seek death in battle as their most glorious contribution to their ruler. In short, Miller looks at the future and finds a simple extrapolation of the past and the present. Furiosa was born in the Green Place but was captured at a young age and grew up at the Citadel, and now carries the weight of guilt for having helped Joe consolidate his power. Somewhere along the line, she also lost an arm, but that would never slow her down. Max, meanwhile, is still suffering living nightmares due to his past failures, and just wants to be alone. Mad Max: Fury Road is ultimately more about Furiosa than Max, and Charlize Theron carves out a performance full of grim determination, worthy of facing down the worst that the dystopian future can throw at her. A crazily ambitious project, Mad Max: Fury Road ranks among the grandest, most thrilling vehicular mayhem movies of all time.